On Saturday night a showcase of fierce and fabulous Fa’afafine dancers hit Corbans Art Estate in Henderson. 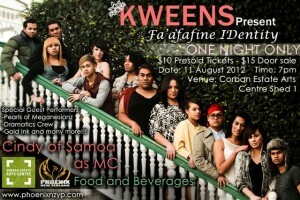 Rainbow Youth wants to send you along to Kweens present Fa’afafine IDentity and has two tickets to give away. All you’ve got to do is email your name and a contact phone number to [email protected] to be in to win the tickets which will be drawn in the next 48hrs. The Kweenz are performing not only to express their love for all-things dance but to create positive awareness around their identities and to share their coming-out experiences with other trans youths. They will be joined on stage by a handful of special guests including the Pearls of Meganesianz and MC Cindy of Samoa. The crew has been working with Phoenix New Zealand for at least a year now after starting a group at Kelston High School.